Leading off today: How much grief might Section 1 administrators have saved themselves had they taken steps earlier this year to communicate some of the findings reported by The Journal News in an absolutely fascinating story Wednesday digging into the controversial move of last winter's basketball tournaments? The reporting by Vincent Mercogliano and Richard Liebson indicates unhealthy levels of paranoia and distrust by some of the people in charge of the section, but also offers evidence that the controversial decision to move tournament finals from the Westchester County Center to Pace University was probably prudent. Though she offered no supporting documentation, Executive Director Jennifer Simmons said the section swung from a profit of only $14,000 for 27 semifinal and championships games at WCC in 2017 to a $39,000 profit for nine finals at Pace in 2018. • The Westchester Knicks promoting their G League team and selling merchandise in the arena without offering financial support to the section. • County officials submitting lengthy lists at the pass gate allowing free admission. • The arena policy prohibiting outside food or beverage being enforced so strictly that teams bringing their water bottles or sports drinks were forced to throw them out. Those points of contention were in addition to concerns that were aired publicly leading up to the move to Pace, namely the section not sharing in the $10 per car parking revenue and dismay over the high cost for a police presence at games. It's fair to ask how public perception and media reporting would have been affected had Section 1 done a better job communicating that sort of information before and after the tournament. As it is, they could be headed for another contentious decision-making process as plans move forward for selecting venues for the 2019 semifinals and finals. Section 1 will be using request for proposals (RFPs) to solicit proposals from venues to host. "I do believe that it's not just a dollars and cents calculation," County Executive George Latimer said. "There's something else at hand here. If (Section 1 leaders) really want to show their constituents, then they sit at the table, they negotiate with us and they come back with a deal. And they'll find, as they did earlier this year, a willing partner." More Section 1: The story from The Journal News that I linked to above contains plenty more "inside baseball" fodder hinting at distrust and dysfunction within the organization's highest ranks, and it really is an amazing read -- quite different than the usual high school sport fare of scores and statistics. that raises eyebrows considering that there's a nearly $6 million annual budget. I haven't had time to digest it all yet, but it will be mandatory reading for me tonight. Football: East defeated Wilson 13-12 in the resumption of a Rochester City Athletic Conference football game that had been suspended in Week 2 due to fighting in the stands. East senior scored the tying touchdown and then put the Eagles ahead with 1:07 remaining with his conversion kick. The winning drive came after East 45 recovered a fumble near midfield. Wilson held a 12-6 lead at halftime when the game was suspended Sept. 15. 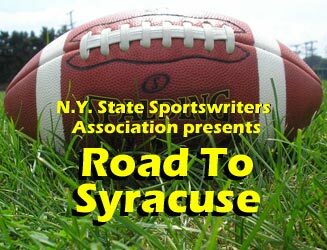 East (5-0) is poised to move into the NYSSWA Class A ratings ahead of Wilson (3-2), ranked 23rd this week. Goals record falls: Belfast senior Adam Enders scored a pair of first-half goals Tuesday during a 6-1 win over Hinsdale to become Section 5's career scoring leader in boys soccer. Enders, who has 27 goals for the season, had tied the sectional record of 132 goals with a hat trick during a 3-1 win on Monday. The fifth-year varsity player broke the mark shared by former Livonia stars Alex Korol and Jordan Chirico. The New York State Public High School Athletic Association record is 176 goals by Nolan Ryan at Chazy from 2003-2007. More boys soccer: Second-ranked Rye Neck and No. 19 Blind Brook played to a scoreless tie in a matched of ranked Class B teams from Section 1. Blind Brook senior goalie Mike Abrutyn made a diving stop of a penalty kick with eight minutes left. "I've been in that position before," he said. "We've been in multiple close games, so I just have to hold my own back there. ... I kinda saw him peak there before he went, so I went with my instincts and made the save." More reading: Bob Chavez at the Daily Messenger wrote an excellent profile of Bob Goodell, long a respected coach and coordinator in the Section 5 cross country ranks who finds himself in a difficult battle with prostate cancer. Just glancing at the names scattered throughout the story is a good indication of Goodell's influence in the sport over the years. Extra points: Nick Weiermiller, a 2006 graduate of Elmira Free Academy who went on to a college career at Texas-Pan American, has been named boys basketball coach at Elmira Notre Dame.